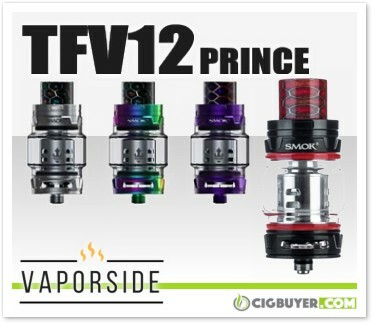 Vaporside just let us know about a pretty sweet deal on the Smok TFV12 Prince Tank – you can grab one for just $27.99 with free shipping. Since most vendors charge $5 to $10 for shipping alone, it’s certainly one of the better offers from a US vendor. The Smok TFV12 Prince Tank is one of Smok’s most popular sub-ohm tanks, incorporating Smok’s trademark hinge-and-lock top fill system with up to 5ml e-juice capacity (8ml with bubble glass). Known for its outstanding flavor and vapor production, the TFV12 Prince includes large, dual bottom adjustable airflow and comes with an attractive Cobra resin drip tip and three high performance V12 Prince coils – Q4, X6, and T10.